Our motto is "You'll love what you find at Wilson's Furniture" because we hand select our furniture for the community we live in. 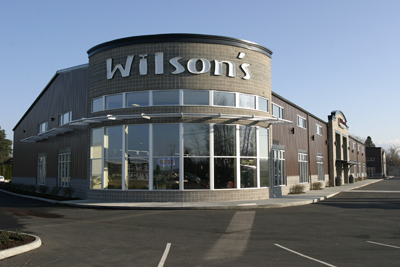 Wilson's is an US owned furniture store located in Whatcom County. Wilson's belongs to a 63 member independent furniture store buying group which provides the purchasing power of a national chain, yet Wilson's is still only one store. We like to say "We are large enough to serve you but small enough to know you." Wilson's Furniture opened as Wilson Home Furnishings in March of 1997 at its original Cornwall Street location in downtown Bellingham. Founder John Wilson started the business when he wanted to move back to Bellingham to raise his children where he was born and raised. He has deep family roots in Whatcom County, one of his great-grandfathers moved to Fairhaven in 1888 and was the County Auditor when statehood was granted. In 2001, Wilson's bought out a competitor and moved to the Fountain District on Meridian Street. By consolidating both stores Wilson's was able to double in size and create one of the area's largest display of recliners. Wilson's grew again in 2006 upon moving to its new location of I-5 at 5080 Pacific Hwy. posturing itself to be conveniently located between Bellingham, Ferndale, Lynden and Birch Bay/Blaine. Wilson's is in a state of the art facility designed to help people find stylish, comfortable furniture for their homes.